A petition launched on Change.org by Truth Wins Out and Dan Choi calling on Hong Kong’s government to drop its support for “ex-gay” quack therapist Hong Kwai-wah has reached 20,104 signatures. Hong Kong’s Social Welfare Department recently held a workshop for its staff led by Hong Kwai-wah who claims he can “cure” LGBT people by having them take cold showers. 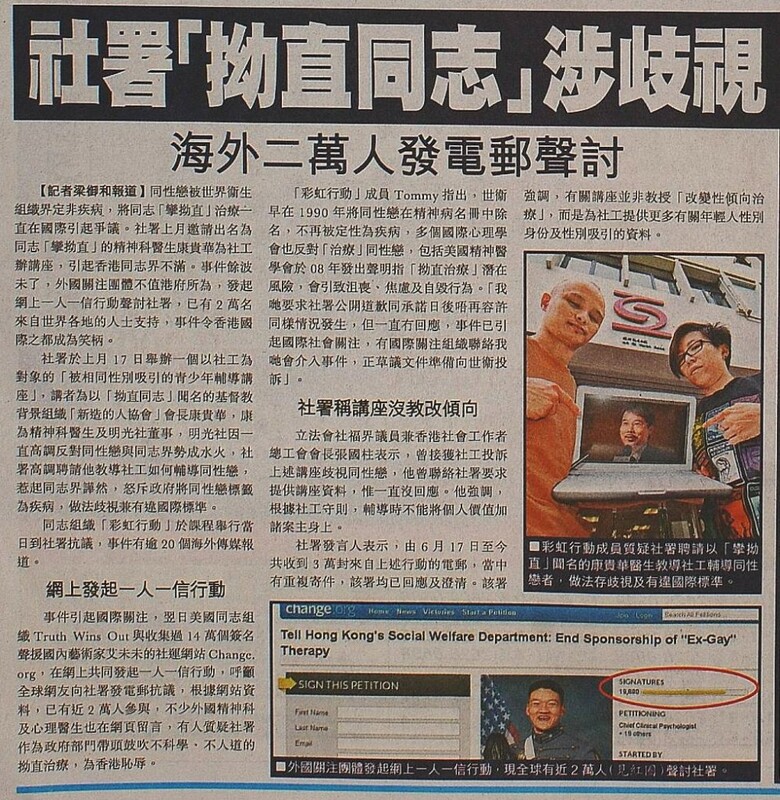 The effort to infiltrate Hong Kong’s government and promote anti-gay ideology is spearheaded by Canada-based Exodus Global Alliance and United States-based Exodus International. When: Sunday, August 7th, 11:00 AM to 12:30 PM. The American Psychiatric Association, The American Academy of Pediatrics, The American Medical Association and the American Psychological Association all say that there is no evidence to support the efficacy of so-called “ex-gay” therapy and attempts to change sexual orientation can be psychologically harmful. The Hong Kong organization Rainbow Action got the ball rolling with a protest of the Hong Kong Social Welfare Department and is leading efforts in Hong Kong on this issue.